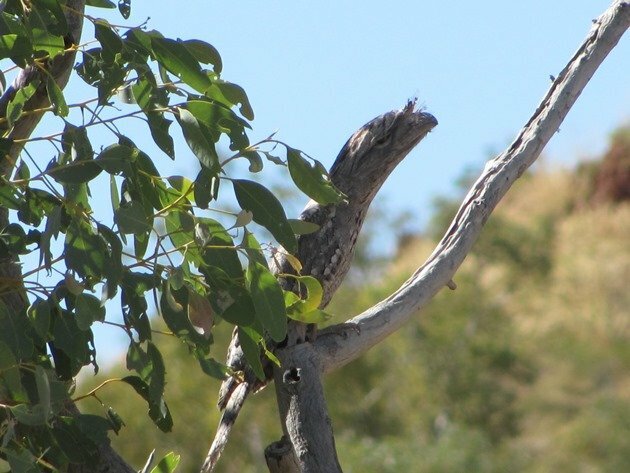 One of the most camouflaged birds in Australia is the Tawny Frogmouth and we often hear them at night when we are camping in the bush, but the chance of seeing them is less likely. They feed at night by swooping down on prey from the branch they are perched on or chasing moths in the moonlight. 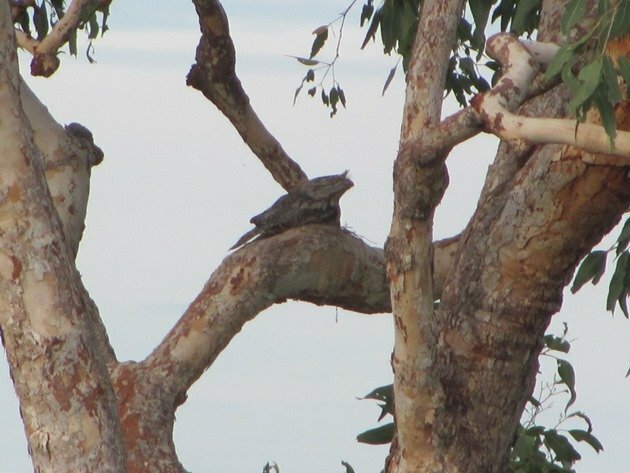 Tawny Frogmouths spend the daylight hours perched on tree branches heavily disguised by their silver grey plumage. Tawny Frogmouths are often an accidental sighting when you are looking for other birds in trees and something just does not look quite right about the shape of the tree. Once a Tawny Frogmouth notices it is being observed it stretches its body out to give you the impression that it is part of the tree and holds that pose until it feels it is no longer being watched. 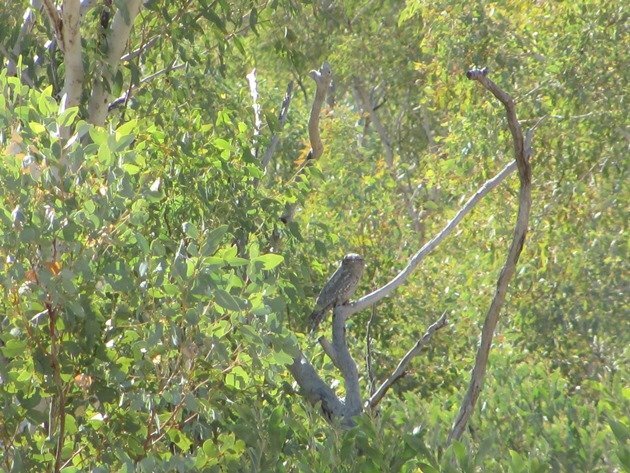 Last year we were fortunate enough to not just hear Tawny Frogmouths, but we observed one at the Halls Creek Poo Ponds during daylight hours. The first impression you may get when you observe a Tawny Frogmouth is that it is some sort of Owl, because it can look similar. Tawny Frogmouths are actually more closely related to the Nightjar family. Tawny Frogmouth before it changes shape! 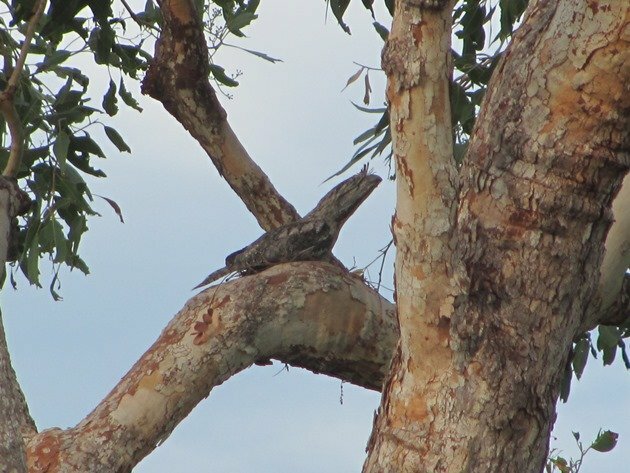 Once I got out of the vehicle to approach for a better photo the Tawny Frogmouth soon took on the shape of the branch it was stood on. 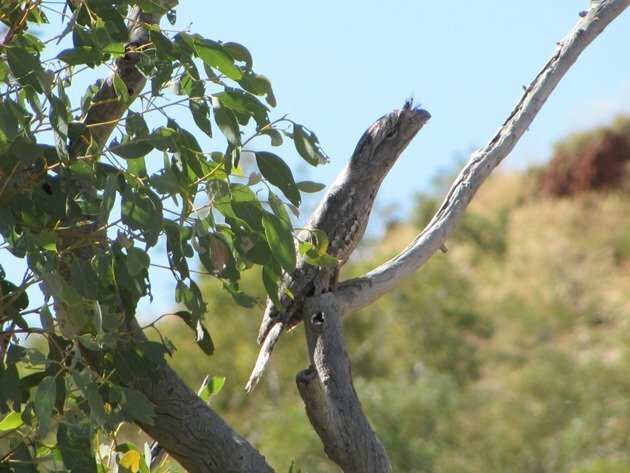 Tawny Frogmouth becomes a branch! 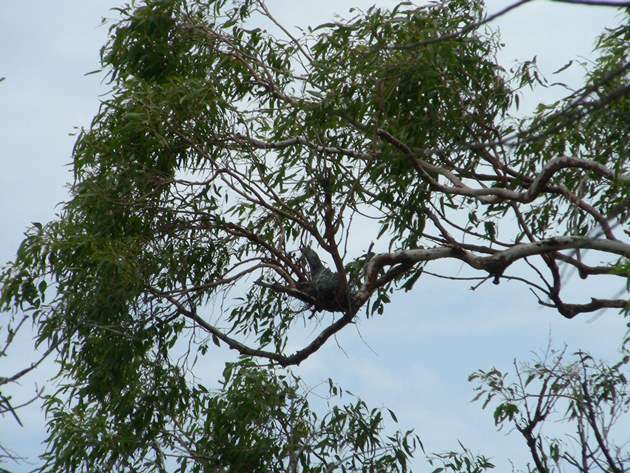 We have only encountered a Tawny Frogmouth nest once before and that was at the Broome Poo Ponds in January 2010. On this occasion we had not been in the area for a while and when we did notice the nest it had a parent and chick in it. The nest was quite substantial and in the fork of a tree close to the road. Once again it was just noticing an odd shape about a tree. The Tawny Frogmouth had noticed the vehicle and had already put on the pose of being part of the tree, despite being in a nest! On getting out of the vehicle it appeared that even the chick had taken on the pose in the nest! 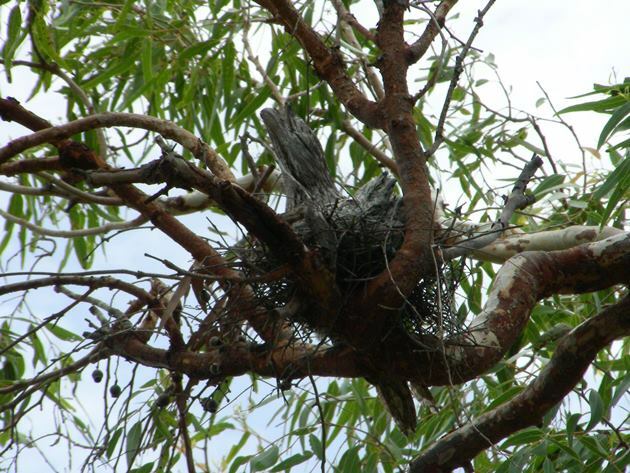 So, five years on and we found another nest with a Tawny Frogmouth on it. They breed after rain events and this was exactly the situation once again. 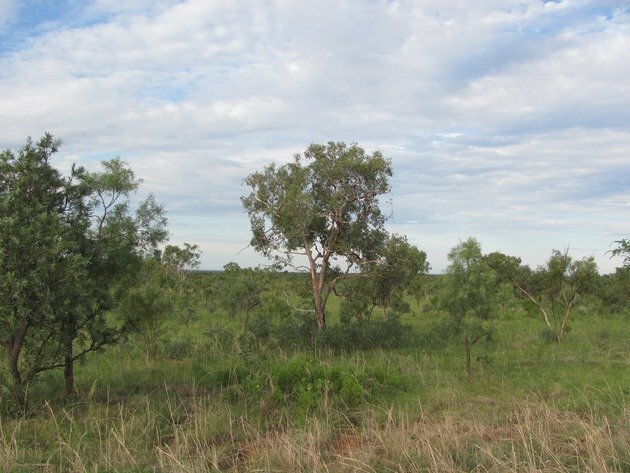 This time we were not in Broome, because we have had no Wet Season rain yet and went looking for “greener pastures” to the north last weekend. We decided to risk the rain and head north and visited Ellendale Dam to see how different it looked in January compared to September. The dam was very full and there were numerous species of birds present. Most were similar to what we had seen in September, with the addition of Magpie Geese in the flooded long grass. The main difference was the reduced numbers of individual species and this would be because there was now other water sources after recent rains and the dam was not the only water about. It was nothing like the experience in September with literally hundreds of each species looking for water. This time we decided to make use of the Rest Area and use the shelter and shade in case of a torrential downpour, which had occurred earlier in the day. We were the only people crazy enough to be camping in extreme heat and humidity, but the birding was rewarding! Looking across from the shelter we observed a tree beside the road that had an oddness about its shape. At the base of where the leaves started there was a bird. We decided to approach slowly and hope that because the tree was so close to the main highway that the Tawny Frogmouth would not take too much notice of us. We were quite surprised at the lack of a nest structure other than a few sticks, because the last nest we had observed had been quite substantial. Moving quietly towards the tree we were soon observed and the Tawny Frogmouth took on the pose to pretend to be part of the tree despite being on a nest! 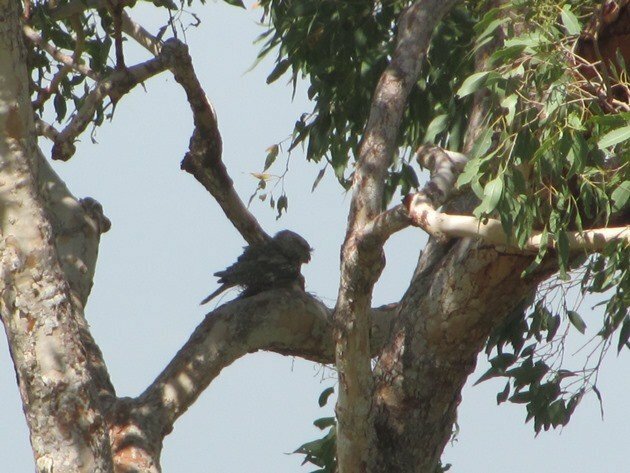 Tawny Frogmouth pretends to be part of the tree! We didn’t observe a second Tawny Frogmouth in the area, but during the night we heard them and the sound was coming from two directions. In fact there were plenty of bird sounds during the night and the following morning and some birds are easily heard, but less often observed. There is actually a website that lists the birds more likely to be heard than observed and the Tawny Frogmouth comes in at number 4! Number 2 is the Channel-billed Cuckoo and it was loud and noisy very early when we awoke and didn’t want us lying around in the tent too late…beyond 5am! That’s such an amazing bird! I love the photos of it turning into a branch. I would love to see one one day!